Those are the opening lines to the song "The Prince", the debut single from MADNESS, the most successful band to emerge from the UK's Ska movement in the late '70s. They were singing about Jamaican Rocksteady/Ska legend PRINCE BUSTER, an artist who barely cracked the charts in the States but was extremely influential in Jamaica during the '60s and beyond. This popularity spread throughout the UK in the '70s, and every Jamaica-obsessed British youngster adored Buster alongside his more famous Reggae contemporaries (Jimmy Cliff, Bob Marley, Peter Tosh, etc.). While many of the mid to late '70s Punk acts incorporated Reggae and Dub into their sound, there was a new breed of bands who loved the earlier Ska and Rocksteady grooves of acts like Alton Ellis, Desmond Dekker, The Maytals, The Paragons and Prince Buster amongst many many others. These bands included the aforementioned Madness plus The Specials, The Selecter, The (English) Beat and Bad Manners to name just a few. All of these acts formed the core of what has been called 'the second wave' of Ska or 'The 2-Tone Movement', named after the 2-Tone label set up by Jerry Dammers of The Specials. And 30 years later, this second wave remains perhaps more memorable than the first wave of the '60s and the third wave of the '90s. So,that's it for your history lesson today. Oh, yeah. I want to tell you about this fabbo reissue of PRINCE BUSTER's 1967 album, Ten Commandments (Reel Music), or to list it's full title, Prince Buster Sings His Hit Song Ten Commandments, which was a U.S. only release at the time, consisting of a handful of various Buster recordings that leaned more towards the soulful side of Jamaican music. In fact, throw it on in your store, at a party, in your car, etc. and what you'll hear is a groovy slice of '70s Soul, but listen beyond the surface and the core of each and every track is pure Jamaican pleasure (or Rocksteady, if you will), right down to the rhythm and backing vocals. The album is a smooth and self-assured collection of tracks that may have been the U.S.'s first real introduction to Buster (being released through RCA at the time), but it was, by no means, the beginning or the end of his incredible recording career. 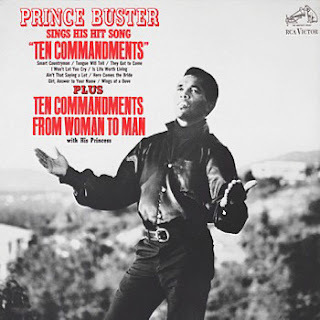 The title track, "The Ten Commandments (From Man To Woman)" is about as sexist as as song can get and woud never be played on the radio today, but he does try to balance it later on the album with "The Ten Commandments (From Woman To Man)" by one Princess Buster (who incidentally verbally beats him down when he tries to interrupt HER ten commandments!) Other tracks of note include "Wings Of A Dove" (did Cat Stevens steal the melody of this chorus? ), "Girl, Answer To Your Name" and 'They Got To Come". If you're searching for the Ska beat that inspired 2-Tone, it's not as prevelant here as on some of his other releases, but it is definitely here. The album contains so many musical reference points that were later used by the British Ska bands (Madness even used the title from the aforementioned "Wings Of A Dove" for a later single). But if you're searching for classic Rocksteady and music that helped pioneer the Jamaican music scene, then Prince Buster is a name to be reckoned with and The Ten Commandments is a more than worthy reissue that must be added to your collection pronto, mon!